As we head into the final term of the academic year I always find that the children's white t-shirts and shirts start to get tired looking. But with just one term left I really do not want to be going out to buy new shirts for three children. So when I was asked if I would like to try some Dr Beckmann products I saw it as the ideal opportunity to not only save me buying more shirts but to also put the products to the test. The Stain Devils Pre-Wash works on both old and new stains. Dr. Beckmann’s Pre-Wash Stain Devil contains a unique Triple Active Complex that’s tough on stains, yet gentle on fabrics. Removing a variety of everyday stains from grease to baby food, this powerful gel is suitable for all washable white and colours, even working at low temperatures, on short cycles. This household essential doesn’t contain bleach, yet works fast to remove stains in 10-15 minutes with the help of the unique soft brush applicator. This is a great way to target stains without treating the whole garment. Dr. Beckmann Glowhite ULTRA, contains an intensive formula which removes greying and yellowing of fabrics, producing spectacular results. This is the ideal product to brighten up those dull school shirts. Priced at just £2 for two sachets makes it a lot cheaper than buying new shirts! 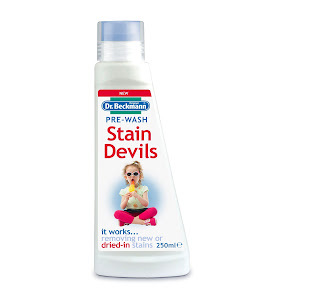 Dr. Beckmann Stain Devils have long been the UK’s favourite stain specific stain removers. Now you can get all your favourite Stain Devils in this handy Survival Kit. Dr. Beckmann Stain Devils Survival Kit removes over 40 of the toughest stains quickly and easily, guaranteed or your money back. Everything from baby food to red wine is covered in this fabulous kit. By having one on standby in your cupboard at all times you will never be caught out again. The Survival Kit contains three of the best selling Stain Devils; Tea, Red Wine, Fruit & Juice, Cooking Oil & Fat and Ball Point Ink & Felt Tip. 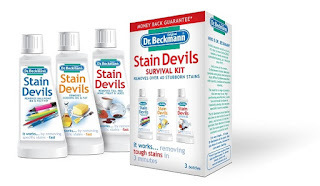 By being prepared with the Dr. Beckmann Stain Devils Survival Kit you can remove tough stains immediately and effectively, saving you time and money. This handy little box will come to the rescue at any time, I am even planning on packing them for our holiday as it guarantees to remove red wine, curry sauce, pasta sauce (my kids always get pasta sauce down them! ), pen ink (my eldest always has pen on his school shirt! ), butter, cooking oil, fat (they are my problems while cooking as I always forget to put on an apron!) and even fruit juice and berries! If you have a stain that you are worried about pop over to www.dr-beckmann.co.uk and check out their 'Stain Clinic'. Simply add in the stain that you have, plus the fabric click on 'Solve my Stain' and they will tell you the best product to use to get your clothes back to new! You can even enter your details to claim your free sample their Colour and Dirt Collector sachet. What are your top stain removal tips?